Tracked robots have static stability, and typically should not get 'stuck' on terrain the way wheeled robots do. Also, you can build, drive, and steer a tracked robot with only 2 motors. The downside of the design is that to turn, they have to 'skid' or slide. 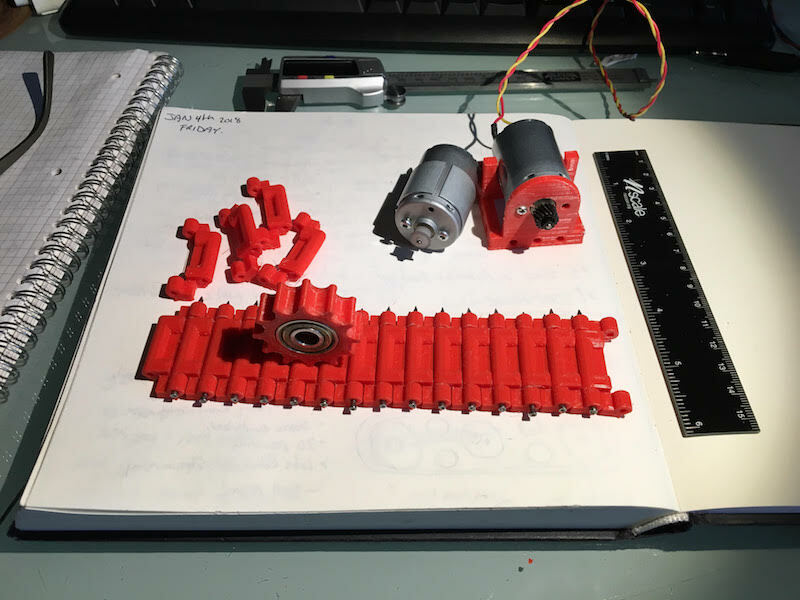 I wanted to design a track system that will be modular and can be combined with other tracks and platforms to easily create new robots. I really like the modular designs of the Intukun pipe inspectors robots. 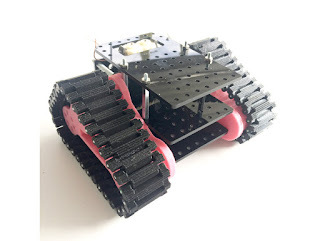 Their mini-track crawler is an impressive piece of crawling hardware. Of course, I wanted to build one like this too. The other design influence was closer to the Maker space. 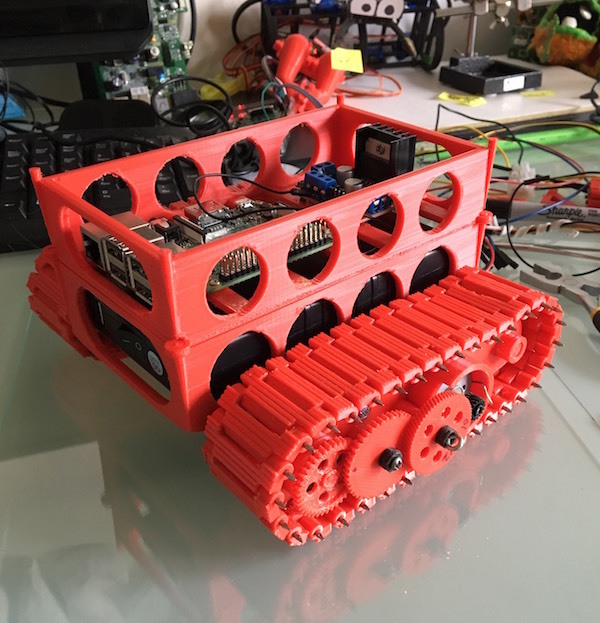 On Thingiverse, I found a great design of a robot tank by Tim Clark, MR6 - Mini Prototyping Tank Robot. Tim had obviously put a lot of thought into this design. This robot is at least his third design variant on crawling robots. Being his latest model, it probably has the most learnings. I really liked the skateboard bearings he is using, as well as the track design, and the various layers of support frame. Although, I am still not sure what is the advantage of raised cog/sprocket to form a triangle. 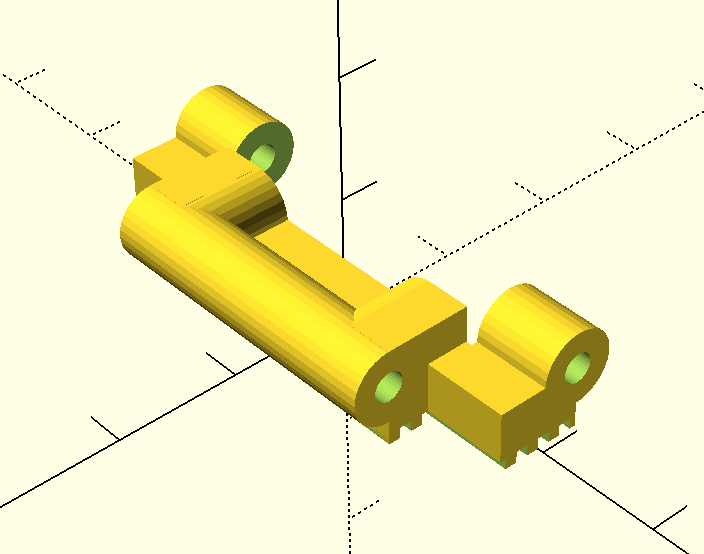 I did not use his design, except for influence - I needed to have the design in OpenSCAD, and he did not provide source files openly. I set out to design my own tracked crawling robot using ideas from both of these designs. In addition, I wanted to re-use 12V motors that I have harvested from old printers. Track, Sprocket, and Motors -- Ready for Design! 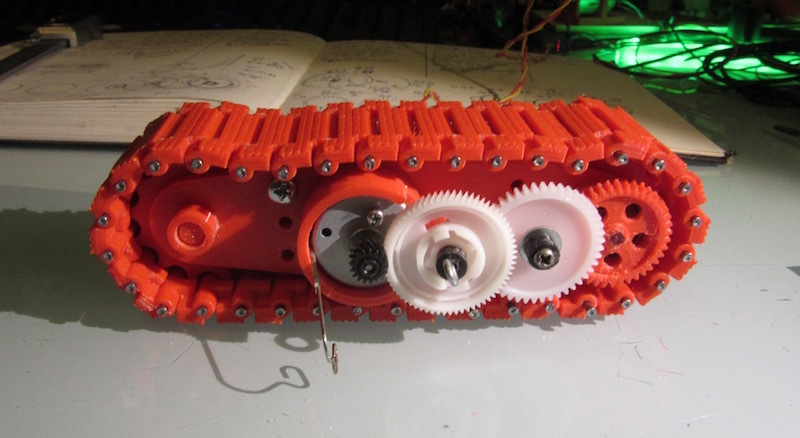 I want the motor to be inside of the treads, so that there is no axel crossing between a motor and the gears, thus raising the ground height of the robot frame. Only the motor power wires and the mounting frame will need to go on to the track module. 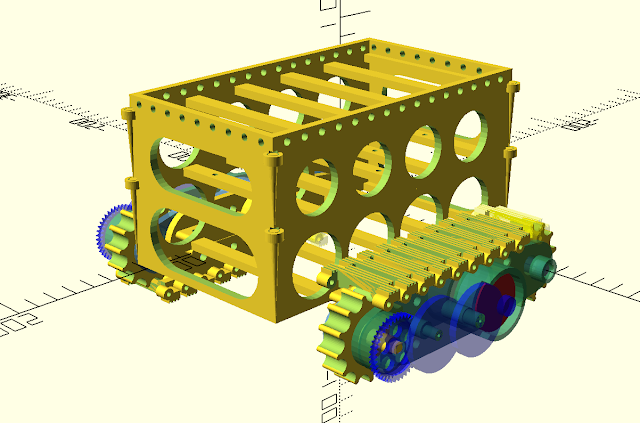 Thus the height dimension of the unit will be dependent on the motor size and clearance of the treads and sprockets. 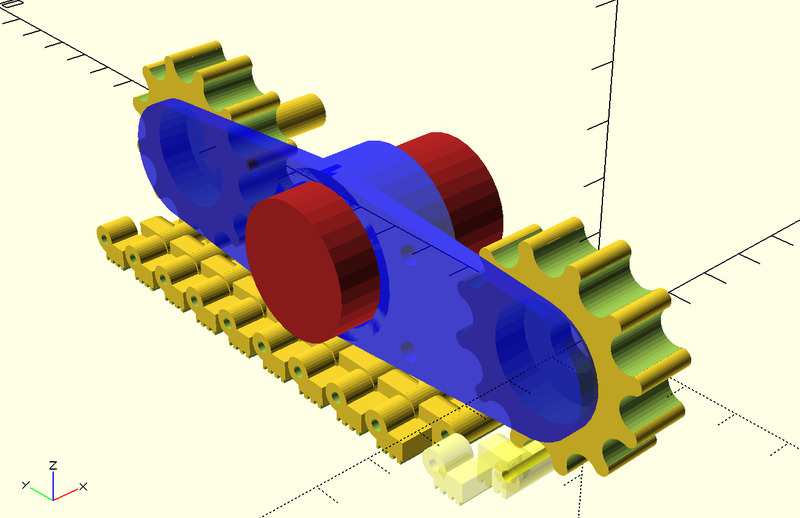 (Red) Motor between two sprockets, creating a contained track modual. the width of the treads has to account for the width of the motor. This affects the width of the sprocket/cog. The sprocket will contain a 22x7mm skateboard bearing. So, ultimately the sprocket is dependent on the bearing size, and the tread is dependent on the sprocket. The length of the track would be dependent on the sprocket size, motor size, and amount of gear reduction needed between the motor and the drive sprocket. This value had to be determined in a few design iterations. Also at play the size of the gears and the size of the sprocket are closely coupled. In my build process I needed to add size to the sprocket to account for the larger gears I needed. The sprocket size was increased, to provide more clearance to the motor and gears. Since the sprocket gear tooth size is directly linked to the tread size, increasing the sprocket, but keeping the tooth size, meant that I needed an additional tooth on the sprocket. 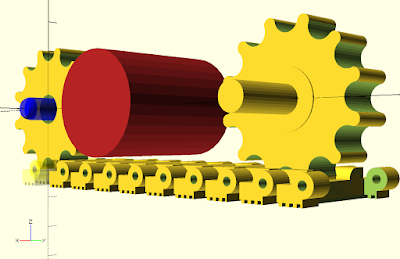 Thus in a design iteration, changed the sprocket from 12 teeth to 13 teeth. This very subtil change has impact on the rotational angle location on the sprocket disc. I examined Tim Clark's treads very closely. I also examined the changes he made from earlier designs to later ones. The result I saw was from early to later designed the length (size of step) of each tread was getting smaller and smaller. This result in a more fluid chain of treads. To keep the build process simple, I am using small nails that slide through the Tread Segments to lock them together. The gears used to transfer the torque from the 12v printer motors to the sprockets had to be carefully designed and fitted. The motor has a high speed and needed to be stepped down in a compact space. I experimented with gears reused from old printers. 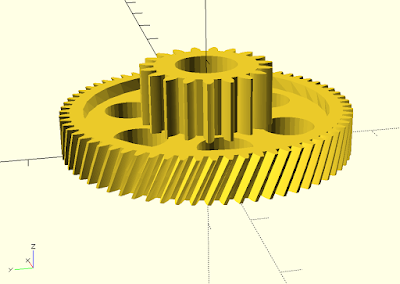 the common design is a large top gear connected to a smaller gear on the same axis. 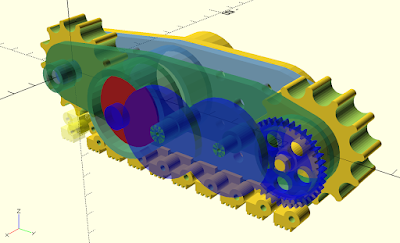 This provides a method to reduce the rotation speed for each gear step. The motors had diagonal toothed gears already on them. I used a open source gear library in OpenSCAD to design the gears. Using more fine settings on the 3D Printer produced incredible results. One gear of 4 used in the design. Interestingly, building laterally symmetrical (no upside, downside) means you do not need to have a left or right side. 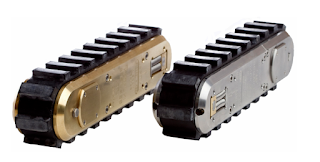 the unit can be flipped or rotated to either side of the robot. By making two copies, I can rotate one tread around to have the symmetrical pair, without having to have a second design. 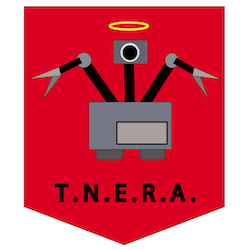 Here is assembly construction of the first robot. Here is the first print made of the robot, complete with parts. Completely 3D printed.